The Meinders School of Business regularly hosts outstanding speakers to further intellectual rigor, critical thinking and professional excellence in many disciplines through our speaker series. In 2010, a grant from the Karl and June Martin Family Foundation in the amount of $150,000 provided funds to establish a distinguished speaker series, focusing primarily on energy through the Meinders School of Business. 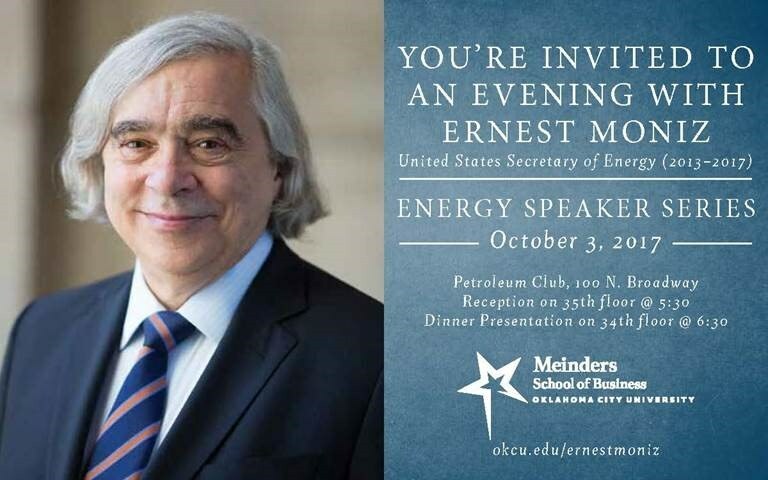 Each year, the Meinders School of Business has the opportunity to bring nationally recognized energy experts to Oklahoma City to address some of the most pressing energy issues the world faces. The Karl F. and June S. Martin Family Foundation Energy Speaker Series features distinguished experts who give presentations about all aspects of energy including forward-looking estimates of demand and how that demand will be met by current and future energy forms. The annual conferences provide for an intellectually stimulating opportunity for students, faculty and professionals in the energy industry. The grant also funds scholarships for students working at the Steven C. Agee Economic Research & Policy Institute located in the Meinders School of Business. Reception on 35th floor @ 5:30 p.m.
Dinner Presentation on 34th Floor @ 6:30 p.m.
Corporate tables and individual tickets available.